Colors: Top #2(55%) - Bottom #6(45%). 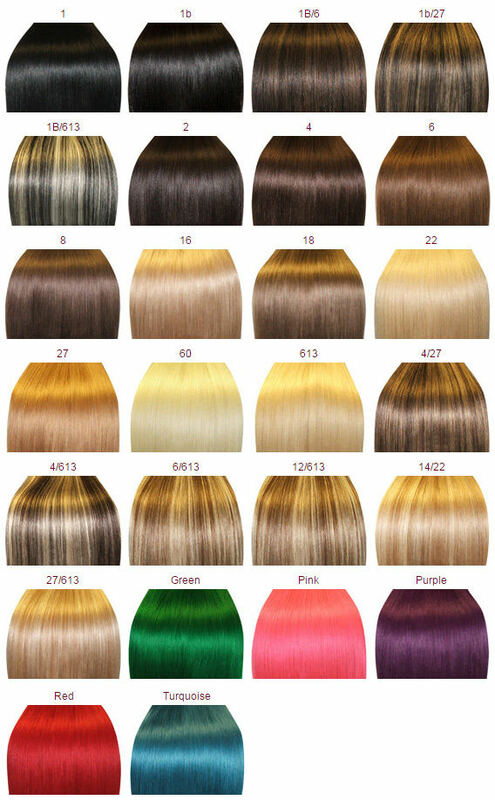 100% remy indian hair extensions and very competitive price! Avg. Product Life:exceeds 1 year. The first time I bought my MHE hair they lasted soooo long. I never washed them much. But before getting married I decided to buy a new set because the previous ones were getting short due to usage of iron. I love them! This time around the dirty blonde color came out Soo much prettier! It’s less yellow and more lower tones. I Love my seamless Market hair extensions! I Couldn’t imagine life without them. I have recieved so many compliments about my hair since the first time I’ve worn them, you can’t even tell they’re extensions. They blend in, feel 100% real and match perfectly to my natural hair. Love Love my hair extensions. My own hair is naturally pretty long but very very thin. I’ve been wearing Market hair extensions for years and they are amazing! They make my hair so thick and voluminous. Definitely will buy again and again. My hair is very thin and lacks volume. I was tired of having lifeless hair so I decided to try Market hair extensions after weeks of browsing. I can honestly say that I LOVE these hair extensions. They match my natural hair color and texture perfectly. Every time I wear them, I get so many compliments. I've never been so happy with a purchase before. These extensions are perfect. Match my hair perfect. I’m a cosmetologist and I can tell you the hair quality is fabulous. My husband was shocked at how these extensions look exactly like my natural hair! I recommended to many of my customer and they also keep praising. Thank you guys. I have been doing hair for 10 years and these extensions r actually good quality human hair at a below retail price. This price is excellent and the seller was very professional and on time. I love these hair extensions and will buy again. Great color extensions. exactly as pictured. great quality of hair and easily applied. It adds great volume and length to my own hair, and it matched my hair color! definately a great deal. The customer service is great and helpful. I wore these extensions to a holiday party and got so many compliments on how great my hair looked. The color match is amazing. They were easy to put in and easy to take out. Thank you for keeping me beautiful. 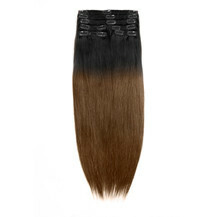 The Ombre Hair Extensions is welcomed by a large amount of people as the multi tone colors are alluring. 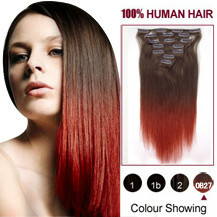 Like the other hair extensions in our website, this one is also made of 100% real human hair. They can not only add desired length and volume to your existing hair, but also can refresh your life. it can last as long as other types of extensions, about 6-12 months. The color is M26(#2/6),the weight is 115g and the life of this hair extension is 12 To 24 Months. Your extensions must match not only the color but also the texture of your hair. While blow-drying, Alyssa used a large round brush to give her real hair the same loose waves as the hairpiece she chose. Separate your hair into upper and lower sections. 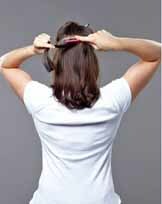 Start parting it at your left temple and move across the back of your head in a straight line to the right temple. Use a clip to secure the upper section of hair on top of your head. If your hair is fine or very straight, tease it along the bottom of the part line with a fine-toothed comb. This will help keep the clips secure. First tease a one-inch section of hair in the middle of the part, then one-inch sections on both sides, just above your ears. Extension is attached to a net with three clips across the top and four around the bottom. Make sure all seven clips are open, then line up the top seam of the netting with your part and attach the top middle clip. Push it down into the teased hair, then press it flat against your scalp. Line up the piece along the part on both sides of your head, pulling it taut against your scalp, and attach the two side clips, one above each ear. 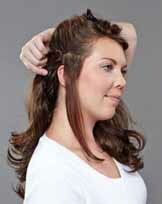 Attach the four lower clips along the lower half of your hairline, around the nape of your neck. Let down the top section of hair and use your fingers to blend it with the extensions. Simply open the clip by gently pulling backwards until you hear the clip release. Then gently remove the section being careful not to pull your hair. It is suggested to move the placement of your sections slightly every couple of wearing. This will allow the clip to rest in a different area preventing too much stress on your hair. Shampooing should be done only after 4 to 5 uses. Gently detangle thoroughly from ends to clips with a pick or wide tooth comb before washing Clip-in Hair Extensions. Use a gentle flow of water holding your Hair Extensions by the clip allowing the water to run down the hair shafts (does not scrunch or tangle hair). Carefully shampoo with tepid water and moisturizing or detangling shampoo. Do not rub or twist the hair. Gently squeeze shampoo through hair from clips to ends. Rinse thoroughly. Gently squeeze out excess water and pat or squeeze dry with towel. Do not roll or rub hair dry in towel. Gently detangle again with a pick or wide tooth comb. 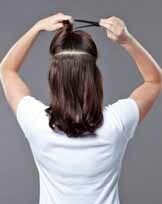 Start with the ends and work upward to remove any tangles (being careful not to pull too hard). Do not brush when wet. We recommend you let your Hair Extensions air dry. 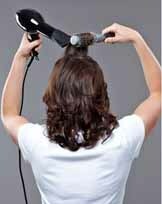 If you do choose to blow dry, use the low cool setting. Store with clips closed to avoid tangling.